Trainees: learn advanced suturing techniques with the top of the range SurgTrac Elite take-home simulator, with access to the Core, Advanced and Elite skills curricula. Single user licence (valid for 12 months) for access to our new SurgTrac software and the 6-module SurgTrac Elite Curriculum (in addition to the Core & Advanced curricula). Complete the SurgTrac Elite curriculum via distance learning, and receive remote assessment & feedback from our faculty. 6 laparoscopic instruments: a pair of needle holders, ratcheted grasper, non-ratcheted grasper, scissors, & knot pusher (to make reusable endoloops). 3 practice models and all required disposables, including a box of sutures: Peg-board (with thread), three-clip board (with suture pad) & four-clip board. Technology meets simplicity with the fold-up trainer that works with your iPad*, iPhone*, tablet, or smartphone. Ideal for residents and sales demonstrations. The Lap Tab trainer™ with Side Ports is ideal for residents to take home and practice. Being our most portable trainer yet, the Lap Tab trainer™ with Side Ports is small enough to fit into a backpack and is simple to set up. *iPad and iPhone are registered trademarks of Apple Inc. Camera: Tablet or phone must have a camera. Ports: 4 Ports with replaceable grommets. Grommets: 5 and 10mm interchangeable grommets. Pelvic Box: New fold-up design. Lights: Open design allows natural light to illuminate work area. Monitor: Tablet or phone works as monitor. (not included) Can connect phone to large monitor or projector. Pulsating organ perfusion was developed for the simulation of operations in minimally invasive surgical techniques. It opens up new perspectives in laparoscopy/thoracoscopy and endourological training. P.O.P simulates all types of hemorrhages (parenchymatous, capillary, arterial, and venous), making it not only possible to learn standard operations, but also to master hemorrhagic complications. In contrast to animal experiments, the exercises can be repeated as often as necessary and practically without time limitations. Furthermore, P.O.P is also highly suitable for experimenting with new techniques allowing for results to be checked immediately. All technologies familiar from clinical work such as high frequency (unipolar, bipolar), lasers, ultrasound dissectors, aqua dissectors etc., can be used in the P.O.P simulation trainer. The central artery of animal organs or organ complexes is catheterized and connected to the pump of the P.O.P simulation trainer. The perfusion medium (colored tap water) in the pelvi-trainer is conveyed into the organ by the pump. The pump works with an electronically controlled frequency of approximately 65 / min and is pressure-controlled (maximum pressure approximately 140 mmHg). The organs are supported on a perforated metal grid. The perfusion fluid passes back into the simulation trainer via side branches of the arteries, veins and parenchymal lesions. The Simbionix PELVIC Mentor™ advanced simulator allows OB/GYNs, family practice doctor, medical students, nurse practitioner, certified nurse midwife, physician’s assistant, to obtain detailed knowledge of pelvic anatomy and to acquire the comprehensive skills required to perform pelvic exams. The PELVIC Mentor is a strong didactic tool that provides trainees with immediate feedback on anatomical recognition and the opportunity to practice a pelvic exam accurately. The unique combination of the model’s anatomical structure, finger sensation and virtual model provide the most effective training tool to date, aimed at developing physician confidence during pelvic examination. This holder is designed to hold the vaginal cuff and ectopic pregnancy models. The Vaginal Cuff cuts, sutures and behaves like real tissue. This product is ideal for vaginal cuff closure skills training under the laparoscopic box and is available in either 2″ or 6″ long pieces. These pads allows you to pin down anatomical models for an end to end or end to side anastomosis. They secure the tissue for training and can be placed in a box to simulate “deep inside the body” vascular anastomosis procedures. MammaCare’s new CBE Simulator–Trainer is a self-administered, palpation training platform that produces and validates breast examination competencies. The computer’s operating program is based on published quality-standard examination protocols. It is used to train clinicians and students who perform or will be performing clinical breast exams and by MammaCare Specialists to train and certify health care professionals. 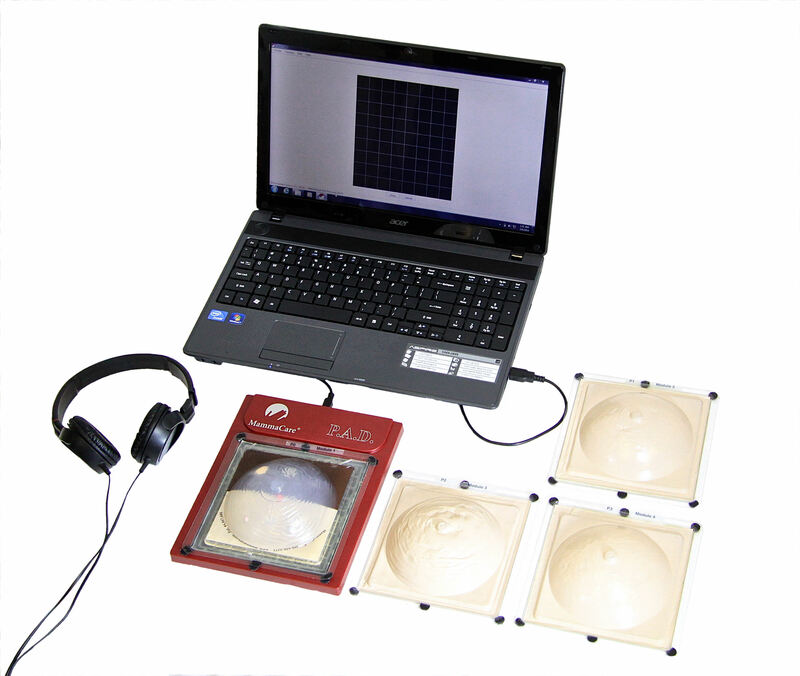 The Trainer’s patented tactile sensor array builds essential CBE performance skills through a series of breast examination learning modules presented via computer. As fingers examine a series of tactually accurate breast models the operating program captures and monitors every aspect of examination performance on the computer. The Trainer advances clinical sensitivity and specificity via progressively more complex breast models that are placed on its surface. A digital “clinical instructor” guides the learner through the training modules, assessing progress and providing corrective feedback. In operation, palpation of the breast models is detected by highly sensitive tactile transducers, received by digital signal processors, and interpreted by a software program that directs practice and performance. The Trainer’s tactile transducers locate and register every palpation at 1024 levels of examination pressure in each square centimeter of breast tissue within 3mm of spatial resolution. 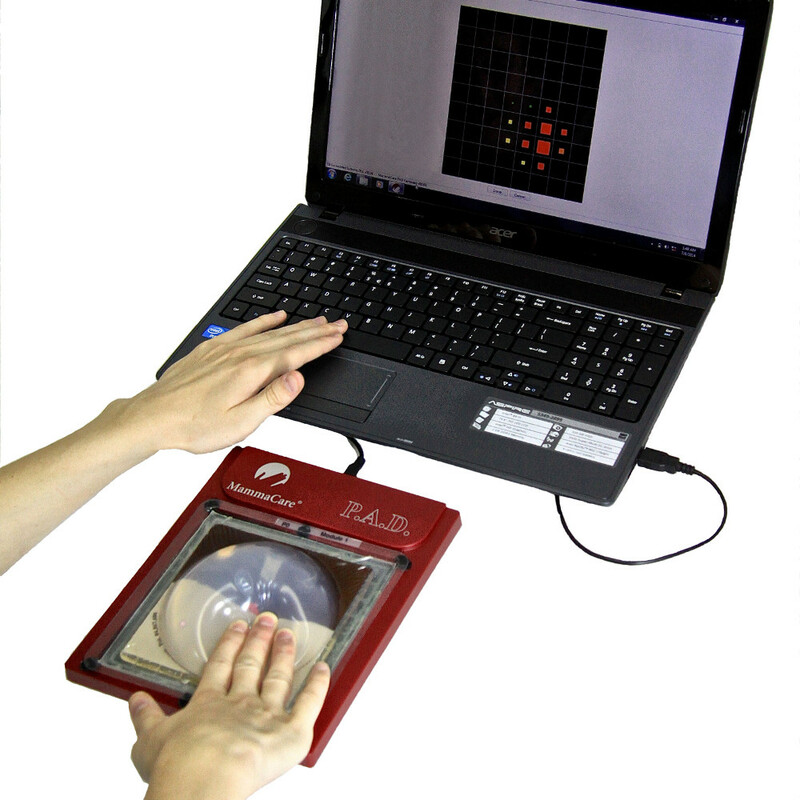 Instructional software measures sensitivity and specificity of the trainee’s performance as it corrects and shapes palpation and search skills. The trainee meets performance standards in each module before advancing to the succeeding one. The MammaCare CBE Simulator-Trainer is the only known technology that quantifies and validates acquisition of breast examination competencies acknowledged as standards for clinical breast examination performance. CTGi provides an economical, highly advanced and realistic fetal heart rate monitor simulation package. Using just two iPads, the lightness and simplicity of CTGi makes it ideal for in-situ training. CTGi gives facilitators a great tool for training and students an incredibly realistic platform to learn from. CTGi offers obstetric simulation as you’ve never seen it before, built off technology you use every day. PickUpSim™ is an innovative, high fidelity system for the simulation of the human ovum collection procedure in the context of assisted human reproduction. Simulation of PickUpSim™ enables hands-on procedural training and permits, thanks to the haptic feedback, simulation of the resistance to penetration of the soft tissues traversed by the Ovum Aspiration Needle, in particular the ovarian surface and the ovarian follicle. Needle movements are allowed both in the forward and in the backward direction. It is possible to move the ultrasound probe in the sagittal plane and to observe a coherent and real-time modification of the scene (allowing the user to investigate the volume of the follicles and to choose the proper entry plane for the needle). Simulated aspiration of follicles driven by a pedal pump. Exercises and Simulations The user can practice and develop competency using simulation scenarios based on real clinical images. the avoidance of critical anatomical structures. A user’s performance can be evaluated on all the above aspects. Control The intuitive control software runs on a comfortable notebook with a wide-view (15.6″) LED backlight display, Core-i3 processor and 4 GB RAM. External LCD Display The external 18.5″ LED backlight display lets you isolate the echographic view bringing more realism to your simulation scenario. TransferSim™ is an innovative, high fidelity virtual simulator designed for training clinicians in the psychomotor and clinical skills associated with the Ultrasound Guided Embryo Transfer procedure. In this procedure, embryos are placed into the uterus of a female, using a soft and thin catheter, with the intent to establish a pregnancy. It is a critically important procedure. No matter how good the IVF laboratory culture environment is, the physician can ruin everything with a carelessly performed embryo transfer. The entire IVF cycle depends on delicate placement of the embryos at the proper location near the middle of the endometrial cavity – with minimal trauma and manipulation. For that purpose, the Ultrasound Guided Embryo Transfer is the most efficient technique currently available.